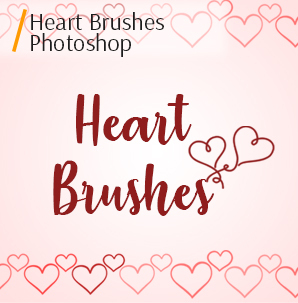 Free Photoshop heart brushes are a tool which helps create a romantic mood in the photo, design an original greeting card or a cute invitation. 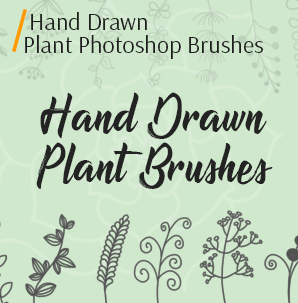 If you have at least basic Photoshop skills, using Photoshop brushes will not be difficult for you. 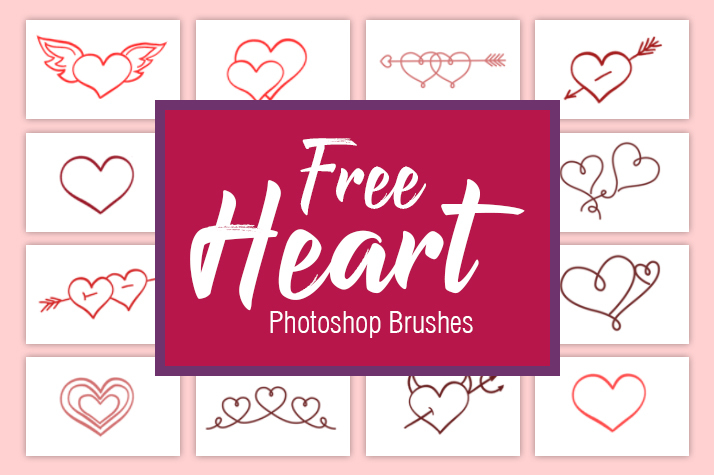 If you are looking for some special tricks to make your projects more eye-catching, interesting and attractive, download the entire collection of free heart photoshop brushes, which consists of 10 originally painted heart brushes. Experiment, combine, change colors and sizes, so you`ll definitely achieve creative and amazing results. What is one of the best Photoshop instruments for all designers? For sure, a good collection of Photoshop brushes. There are so many brushes collections on the web, but it’s very difficult to find professional ones without spam and of high resolution. 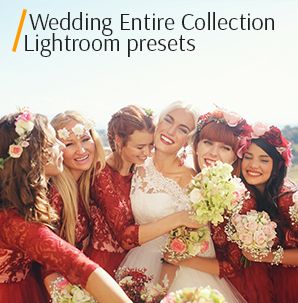 FixThePhoto’s free Photoshop heart brushes collection includes 10 professionally created plugins for creative and fast photo manipulations and designing. Every photographer or designer, either amateur or professional can use them over and over in developing various projects. St Valentine`s day brings a lot of romantic moments and fills your heart with some wonder. The best way to create the mood of this holiday is to share your feeling with people who you love. Create a unique, warm and caring greeting card with a help of the first plugin of the free heart Photoshop brushes collection. 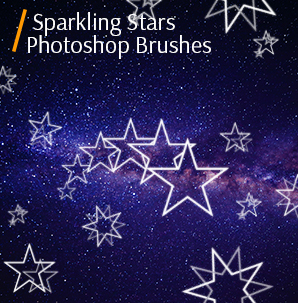 Tips: Use this Photoshop brush to design greeting cards and wedding invitations. Daily routine drags us in and sometimes we forget to express our deep feelings and say the most important words. A heart-warming note stuck on the fridge or a declaration of love note will raise the mood of your beloved person. Create such a note on your own with the help of this Photoshop brush from this free heart brushes for Photoshop. Tips: Place it on your notes as a sign of love to your partner. Your special holiday is coming and you are totally excited about it? Heart photoshop brushes free will help you create a great invitation for friends and family. Make your wedding special in every detail and create invitations unlike all other. Experiment with this free heart Photoshop brush and let your wedding invitation be the most memorable. Tips: Change the hearts’ sizes to create a perfect background for your wedding invitation templates. Have you ever laughed heartily at babies` or children’ pictures? They are always lovely, cute and sensitive, aren`t they? If you take such photos in the nursery or children`s room, complete the background interior with some heart brushes from our collection. Using these heart Photoshop brushes free you can make the picture charming and adorable. What is more, if the nursery room looks like a real adventurous world for a child, share your designer ideas with other parents. Tips: You can use these Photoshop brushes changing their colors according to the interior. 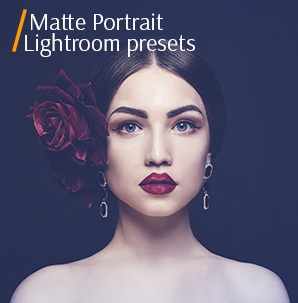 When the background is too dark or too bright, or when the objects behind do not correspond to the mood of the picture, it`s quite necessary to edit photo. Try this brush from heart Photoshop brushes free download package to make your background more interesting and unusual. As a result, the whole image will be changed and you`ll look completely different in the photo. 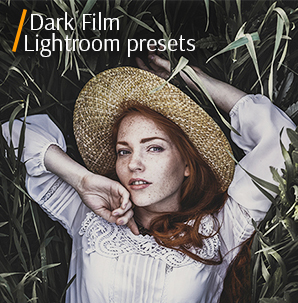 Tips: Highly recommended to use on portrait or couple photos near the trees. Wedding pictures are precious reminder of a special day in your life. They are always full of emotions, smiles and tears, love, beauty and graze. Bring some charm to them using one of the heart brushes for Photoshop free. Tips: These Photoshop brushes let you to create rich artwork without having to draw all the individual design elements each time. Family and children photos will look better if you add a little detail to the background. 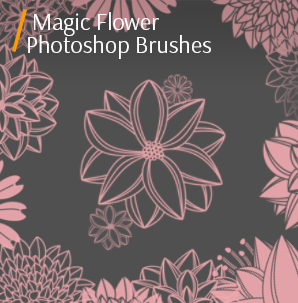 Use these Photoshop brushes for these purposes. So, you`ll definitely enjoy the final result and bring more warmth and love into the photo. Tips: Use Photoshop brushes to design invitations on family parties and children’ birthday parties. To decorate walls in your room is always a good idea. You can create several original posters with the help of heart brushes for Photoshop from our collection and hang them all around the room. Or if you need something to motivate you to go jogging in the morning, eat healthily and move forward. These hear brushes will give you a hand in designing such inscriptions. Tips: You can change the Photoshop brushes’ sizes because they are in the high resolution. If your picture looks a bit monochromic and seems too monotonous, improve it. 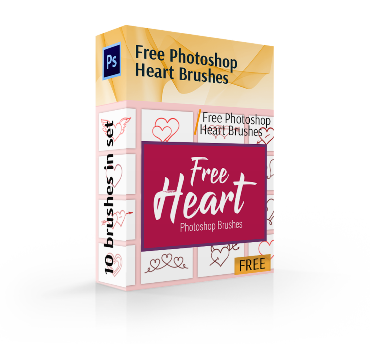 Our free heart brushes for Photoshop have a special brush to make any plain photo vivid and bright. Find the right color, size, effect, and a new refreshed picture will definitely raise your mood even in a gloomy weather. Tips: In combination with other heart Photoshop brushes you can make a creative and romantic background. Photo frames can make your portrait or macro pictures more distinct and recognizable. Free heart brushes for Photoshop can assist you in framing your interior photo. If you have some touching letters and you`d like them to be in sight, don`t hesitate to use this free heart Photoshop brush and bring them new life. Tips: Play with the opacity to receive a natural element on the background.